THE KUHMO GROUP – MEN’s FINLAND FLAGSHIP PROJECT. 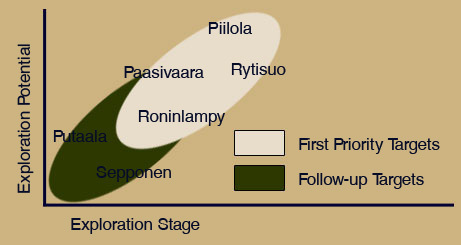 KG includes eight ore prospecting (claim) areas: Piilola North, Piilola South, Piilola-2, Naurispuro, Palovaara, Roninlampi, Teerisuo and Ylä-Vieksi and one reservation application – Putaala. These prospects are located in central and southern part of Kuhmo greenstone belt. The area contains 11 gold occurrences with gold mineralisation confirmed by drilling. Prospecting stage of the Kuhmo Group project is completed. As a result of intensive 3 years field-work program 8 first priority and 6 follow-up drill targets have been localized At the first stage 20,000 m of scope diamond drilling is required. The Piilola prospect area is most advanced in KG. It has significant exploration potential that now could be evaluated at the level in 3-5 Moz of gold.